Apartment Monte Alegre - Paraíso Verde e Turístico. Monte Alegre - Paraíso Verde e Turístico. Lock in a great price for Monte Alegre - Paraíso Verde e Turístico. – rated 9.3 by recent guests! Featuring an outdoor pool and mountain views, Monte Alegre - Paraíso Verde e Turístico. Is located in Monte Alegre do Sul. This self-catered apartment features a garden. Composed of 4 bedrooms and 1 bathroom with a shower, this apartment features a satellite flat-screen TV. There's a seating area and a kitchen equipped with an oven. At the apartment guests are welcome to use a sauna. A grill and water sports facilities can be found at the property, along with a playground. Águas de Lindoia is 26 miles from Monte Alegre - Paraíso Verde e Turístico., while Serra Negra is 12 miles from the property. The nearest airport is Viracopos Airport, 60 miles from the property. 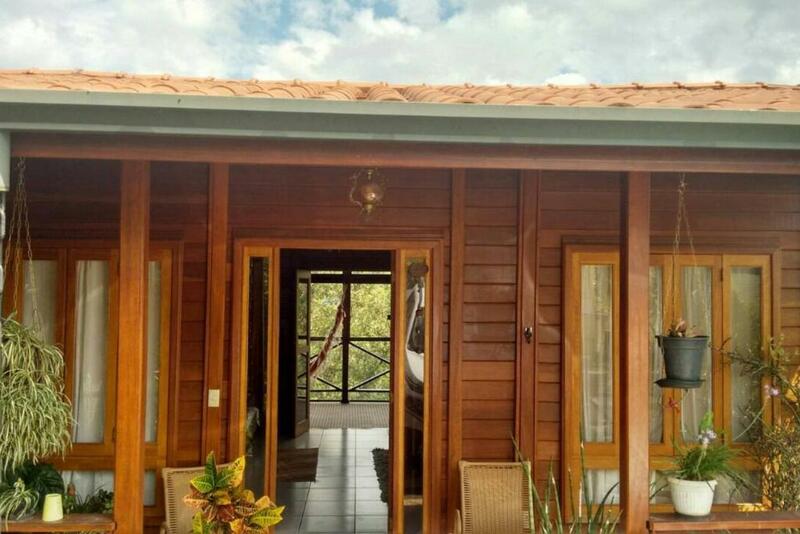 This property is also rated for the best value in Monte Alegre do Sul! Guests are getting more for their money when compared to other properties in this city. When would you like to stay at Monte Alegre - Paraíso Verde e Turístico.? This holiday home has a washing machine, fireplace and kitchen. A casa encontra-se em condomínio fechado, local ideal para que busca verde, tranquilidade e também opções de passeios na região. House Rules Monte Alegre - Paraíso Verde e Turístico. takes special requests – add in the next step! A BRL500 damage deposit is required 14 days before arrival (about USD126.65). This deposit will be fully refunded 7 days after check-out, as long as there isn't any damage to the property. Please inform Monte Alegre - Paraíso Verde e Turístico. of your expected arrival time in advance. You can use the Special Requests box when booking, or contact the property directly using the contact details in your confirmation. A damage deposit of BRL 500 is required. The host charges this 14 days before arrival. That's about 126.65USD. This will be collected by bank transfer. You should be reimbursed within 7 days of check-out. Your deposit will be refunded in full by bank transfer, subject to an inspection of the property.